Product prices and availability are accurate as of 2019-04-19 20:02:30 UTC and are subject to change. Any price and availability information displayed on http://www.amazon.com/ at the time of purchase will apply to the purchase of this product. 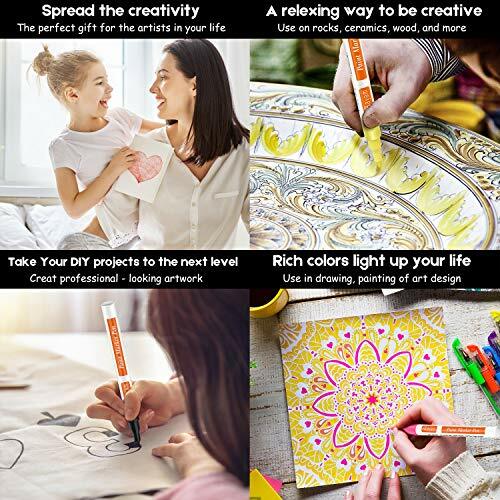 ARTIST QUALITY: Oil Based Medium Point Paint Pen Made with specially formulated, opaque, Permanent ink, Permanent on Most Surfaces. Low odor. Oil-based ink. Non-toxic, Odorless, Acid free, environmentally-friendly. high quality ink is Chemically Stable, Waterproof, and Fade Resistant -- making it easy for you to seize your inner creativity. Dries quickly, no worried about messing up while painting. Including dark and colored paper results are vivid and bright, not just glittery paper. 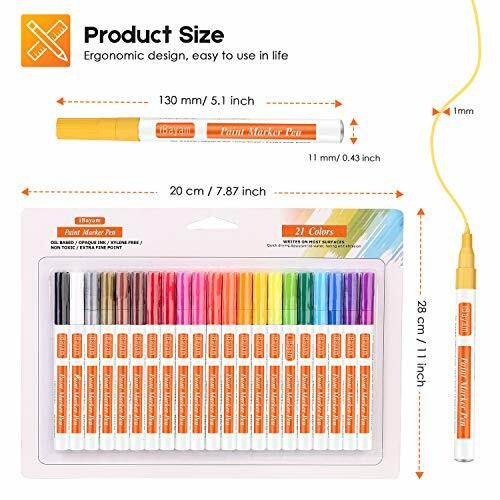 RICH VIBRANT COLORS: This pack of permanent marker gives you a variety of colors. That includes 21 Different Bright Colors: black, white, blue, red, yellow, green, Pink, Violet, orange, Brown, Brilliant Blue, Flaming orange, Glowing Green, Hot Pink, Randiant Red, Vivid Violet, Zesty Lemon- as well as THREE METALLIC COLORS, Gold, Silver and Copper. 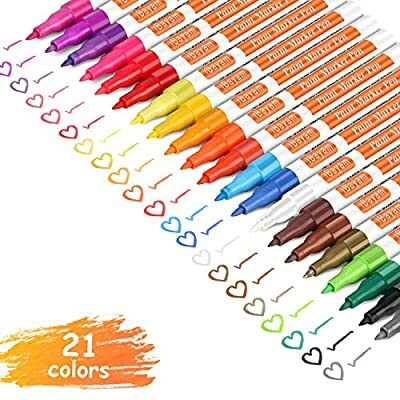 These Paint pens have rich, bold and vibrant colors. 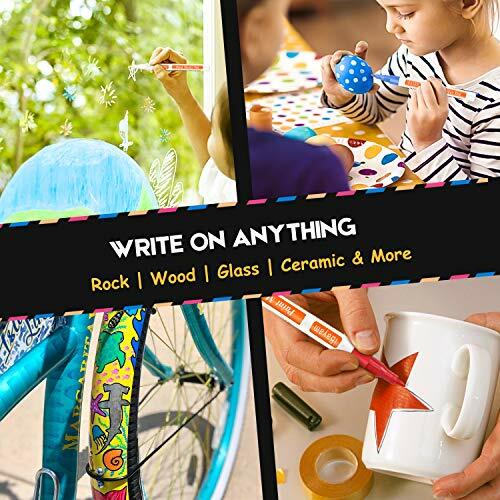 The paint pens are very easy to use with extra protection air tight cap and water resistant ink, WORKS ON ANY SURFACE: The permanent Paint marker work on paper, chalkboard, canvas, wood, brick, stone, glass, mirror, window, metal, plastic, fabric, etc, they' re simple to create vibrant art for both kids and adults. 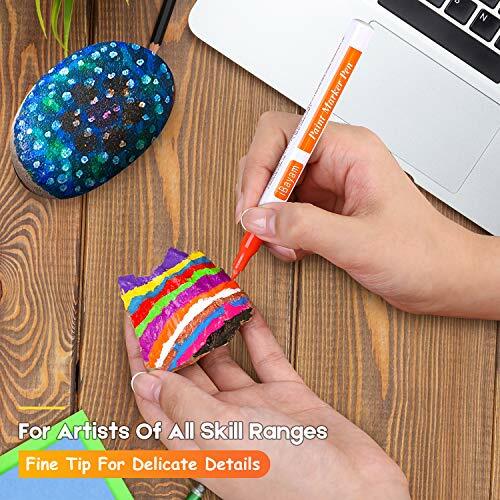 EASY TO USE: put the tip up, with the cap on, shake the marker up and down for about 20 times to mix the paint inside-the steel ball inside will rattle up and down . 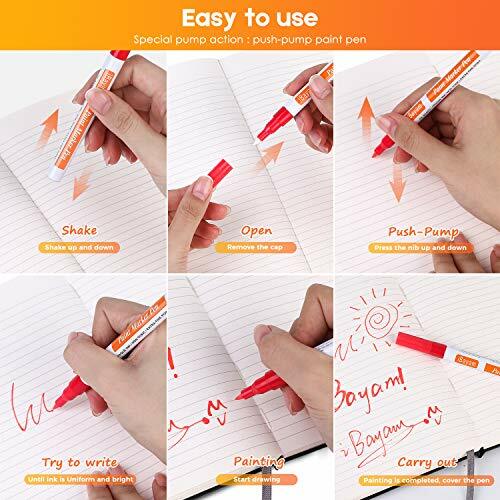 'Special Valve Action' means you need simply push the tip down on paper ,this may take 30 seconds and a few times to prime the pump then enjoy a rich, smooth, free-flowing paint pen experience. ?100% SATISFACTION MONEY BACK GUARANTEE? We confidently back our product with a 100% Satisfaction, no hassle, money-back guarantee!